Ever think to yourself, are my wood windows worth saving? Can I repair them myself? Will I save money on my energy bill? (Answers: Yes, yes, and yes!) Join window restorer Joe Hayes for a class all about windows. 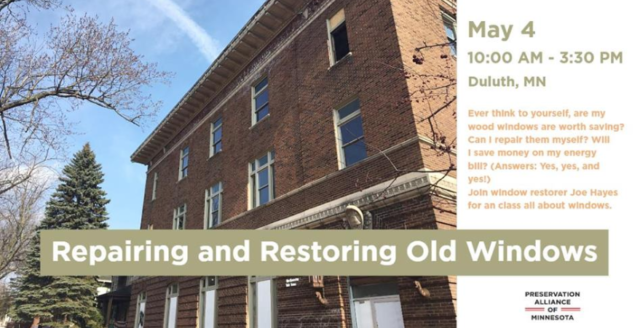 Hosted by the Preservation Alliance of Minnesota and Northern Bedrock Historic Preservation Corps. For Tickets or to learn more, visit Preservation Alliance of Minnesota.